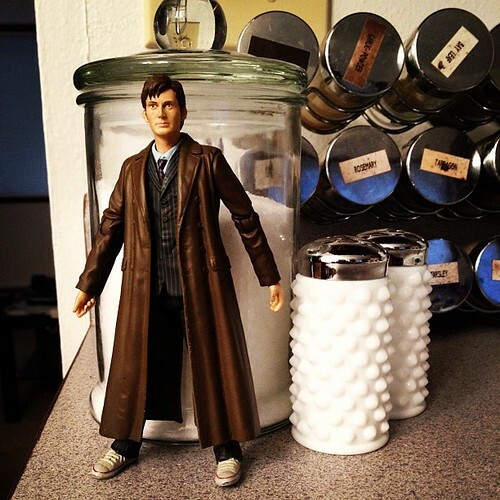 Please put David Tennant down, I can’t concentrate on work when you’re squeaking his coat. Options for kids home sick from school in this house are limited to going to bed to sleep, sitting quietly on the couch while watching Lord of the Rings, doing your homework, and cleaning your room. Everything else is outlawed. If I hear a single squeak or song out of those big eyed lemurs they’re going back to the zoo. Sick kids don’t get candy. Yes, Elijah Wood would make a very pretty woman, but that’s Frodo not Arwen. No my adding machine is not voice activated, but I can talk to it if I want. If my knucklehead is home sick or has a day off I spend most of the time telling him to turn it down or to stay out of the fridge!